Walt Disney (formally Walter Elias Disney) was an American cartoonist, animator, producer, director and voice actor, best known for inventing memorable characters such as Mickey Mouse and establishing The Walt Disney empire. Born in Illinois in 1901, Disney spent most of his childhood in Missouri. He developed an interest in drawing and art at an early age and would often sell drawings to his neighbors to earn some extra money. He was encouraged to pursue his talents by his mother and older brother Roy. He studied art and photography at McKinley High School in Chicago. In 1918, after being rejected from military service (due to being underage), Disney joined the Red Cross and was sent to France for a year. After returning home from France, Disney landed a job at the Pesmen-Rubin Art Studio where he met fellow cartoonist Ub Iwerks. In 1920, Disney and Iwerks formed a company called, “Iwerks-Disney Commercial Artists” but when Disney left for Kansas, Iwerks soon joined him and the company never took off. 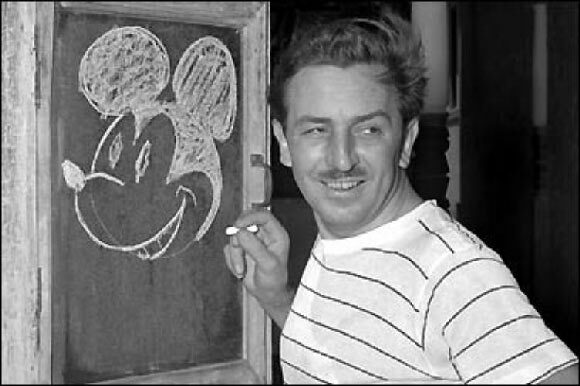 Disney developed an interest in animation and decided to open up his own business for which he hired his friend Iwerks. The company was called “Laugh-O-Gram” but was not successful enough to continue operations, and a bankrupt Disney decided to move to Hollywood at the age of 22. Their first deal in Hollywood was a series of shorts called “Alice in Cartoonland” for a New York distributor named Margaret Winkler and another cartoon featuring “Oswald the Lucky Rabbit”. Winkler later obtained the rights for Oswald from Universal Studios, leaving Disney stranded. She also lured all of Disney’s animators away except for Ub Iwerks who refused to leave his friend. In retaliation, Disney produced two animated shorts featuring his new character Mickey Mouse. Neither was released, however, due to the introduction of sound in films. Disney reworked his ideas, and produced a new Mickey Mouse film with sound, voicing the character of Mickey himself. This was an instant success which led to more successful cartoons such as Silly Symphonies, the first cartoon to feature Minnie Mouse, Goofy, Donald Duck and Pluto; Flowers and Trees, the first cartoon to be produced in color and win an Oscar; and Snow White and the Seven Dwarfs, the first full length animated cartoon. Other Disney successes included Pinocchio, Fantasia, Dumbo and Bambi and in later years, Cinderella, Alice in Wonderland, Peter Pan, Lady and the Tramp, Sleeping Beauty and 101 Dalmatians to a total of more than 100 productions during his lifetime, many of which won Academy Awards and broke sales records. Disney also had shows on television including The Mickey Mouse Club and Walt Disney’s Wonderful World of Color as well as movies such as Mary Poppins, which was the last major successful project produced by Disney himself. Walt Disney is perhaps most famously remembered for the creation of a theme park wonderland called Disneyland. Originally, it was intended to be on a plot of land right across from his studio but the idea expanded to become a gigantic amusement theme park that took five years to develop. Its grand opening was attended by notable personalities including future American President Ronald Reagan. Another theme park by the name of Disney World, was opened in Florida by his brother Roy after his death. Walt Disney was married to one of his employees, Lillian Bound, and the couple had two daughters. He had strong family values and liked to spend time with his family at home rather than socializing with strangers. He died in 1966 at the age of 65. Today the Walt Disney Corporation is one of the biggest conglomerates in the world and owns multiple studios, record labels, media networks such as ABC News, Disney Channel and ESPN and Disney theme parks in other countries. Walt Disney will forever be regarded as an iconic entertainer and entrepreneur, and for creating films and entertainment experiences that touched the hearts of millions.